Khaani enters her own house, I mean her father's house where they lived previously but after the whole recent incidents they were compelled to leave not only the house but also the town. Khaani there recalls some older memories . Sitara begum tries to help some needy persons but no one came there, to receive any thing, and to do prayers for Haadi. Doctor visits the Khaani's father for therapy and we can see in this scene that his condition is improving day by day, from the beginning of episode Arahm is playing a good supporting role for both the characters of Khaani and her father. Mir Shah invites Arham and Khaani's father to his home, he said "that whatever happened was wrong, my son was wrong, but now we can not change the past, but we can save our future". Then he kinda threatens them, by some harsh words. Then Arham gets little angry with Mir Shah and finally, Mir Shah says that "if you lose the case, then your seven generations will pay for this" In reply Khaani's father say that " If you lose the case then till your last generation your respect will be lost".And leaves their house along with Arham. Sitara Visits her Son Haadi in the jail and says him to say what the lawyer says, (as the lawyer said to him in previous episode, where he passed a little smile towards the lawyer). First time I saw some good, or you can say the mother parent relation between them in this scene. 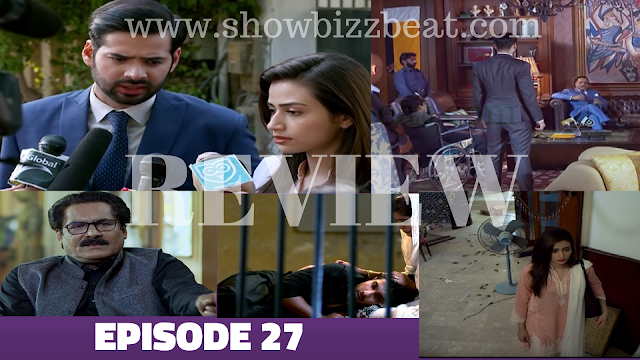 Some other things happens there in this episode, Arham gives a moral support to Khaani, Arham's father gives his mother an advice to support both Arham and Khaani at this time. Meanwhile the media is now also supporting their case, so there is no chance of win for Mir Shah. But till now he is very confident. Again in some scenes the condition of leg and hand of Salman is improving. and he is very happy and hope full for this change, and now he also is very confident about the case and can face the society now. A good scene comes where Mithal and Haadi in jail are having some good conversation with the policemen there. By paying some sufi Phrases. The expressions by both the characters are amazing at this point.